Melbourne-based developer PDG Corporation has recently updated its website with new images of two key CBD fringe projects; 91-111 Therry Street and 611-697 Elizabeth Street. While the design for Therry Street - known as QVM Residences - has been refined in the lead up to the sales and marketing campaign, 611-697 Elizabeth Street now carries with it a completely new scheme. Previously a four-building scheme designed by SJB comprising a mix of residential, student accommodation and retail centred around a network of laneways dissecting the site, the development has now been superseded by a commercial scheme of three buildings, reflecting the strength of Melbourne's commercial market. Read below for further detail on each of the projects. 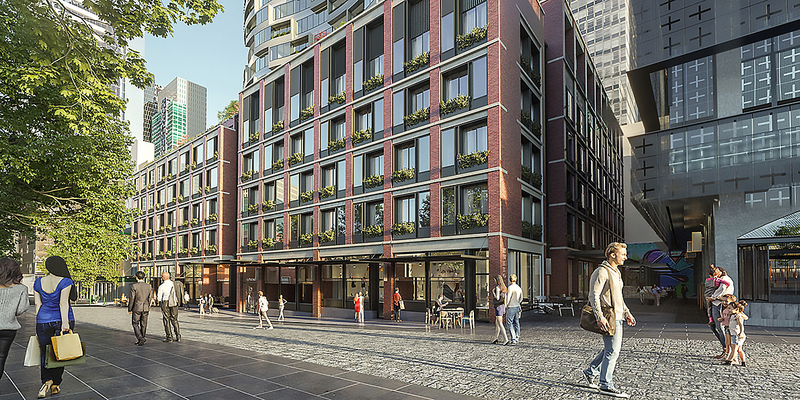 Located on what is known colloquially known as the 'Munro Site,' QVM Residences, as the moniker suggests, forms part of the greater $250 million Queen Victoria Market Precinct Renewal being undertaken by the City of Melbourne. 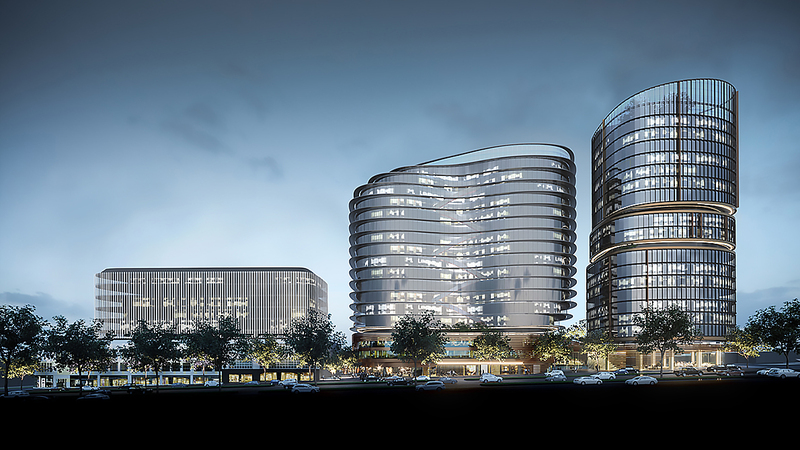 According to PDG, the project presents a dynamic vision for an exemplary mixed-use residential, retail and community destination featuring a boutique hotel, fine grain retail and 360 apartments for sale. Additionally, PDG claims the QVM Residences development has been designed to be one of Australia’s most sustainable mixed-use developments. The tower capitalises on its location on the northern edge of the Melbourne CBD, providing uninterrupted views across the market towards Flagstaff Gardens. Bates Smart have designed the tower's form to maximise direct solar access and to provide natural ventilation to all apartments, resulting in a high level of amenity. The building’s façade is inspired by the fine grain texture of the market’s historic sheds and stalls and is designed to position the tower within its context, providing a deep connection to place. Inspired by the idea of stacked garden boxes, the lower level balconies will be planted with cascading greenery, creating a living, breathing architecture that celebrates sustainability and contributes to making Melbourne a healthier city. The development draws on values of sustainability, health and modern design with the market’s legacy and Melbourne’s laneway culture serving as major points of inspiration. The result is a singular lifestyle offered to future residents, who will enjoy an incredible selection of vegetables, produce, delicacies and bespoke offerings at their door. A celebration of Queen Victoria Market’s traditions. A commitment to sustainability and the leading edge. A promise of world-class residential features – QVM Residences is one of PDG’s most exciting and important developments to date. In addition to the Bates Smart mixed-use tower, the development will also include the City of Melbourne’s largest new community hub and new Queen Victoria Market customer car parking for 500 cars, a pocket park and laneways. The new community hub will deliver a highly active public realm with retail and hospitality at ground level, and community services and affordable housing designed by Six Degrees above. Construction of this component is currently underway with Hamilton Marino at the helm. The QVM Residences received planning approval in May of this year and is expected to be completed in 2021. As alluded to earlier in the article, Elizabeth North replaces an earlier predominantly residential scheme, with Cox Architecture and Gray Puksand engaged to design three commercial buildings of varying heights from 10 to 21-storeys. With Elizabeth North PDG is seeking to deliver a 'dynamic new precinct' within Melbourne’s City North Innovation District capitalising on its proximity to the research and health precinct and the University of Melbourne. The development also stands to benefit from the new Parkville Station as part of the Melbourne Metro project, located just a short walk away. PDG says the precinct has been designed to reflect its location at the convergence of roads at the Haymarket roundabout, which is translated into the confluence of ideas, new technologies and opportunities associated with surrounding institutions and organisations. Our Elizabeth North project is a mixed-use commercial and retail development drawing on best-practice architecture, design and urban planning to provide the Innovation District with world-class amenities. The vision to create a centre for commerce in this future-focused district has been driven by an understanding of the surrounding area’s needs informed by thorough research and conceptual development. Facilities and amenities will be complemented by CBD accessibility. Mere minutes from the heart of the city – and all of its shopping, dining, transport, and businesses – by foot or tram. Elizabeth North is expected to be completed in stages from 2020 through to 2022. It remains one of the greatest heritage scandals of modern times - Melbourne City Councillors voting to demolish all the listed and protected heritage buildings on Thierry St, purely for the sake of maximising PDG's and thereby their own return on investment.